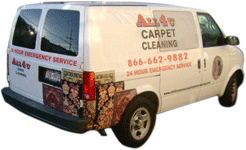 All 4 U is an exceptional Richmond Carpet Cleaning - Oakland Carpet Cleaning service who's work is carried out with skilled and trained technicians. Instead of taking your carpet to a warehouse, we are one of the few companies that brings buffering to your home. Our company guarantees your satisfaction, and we are always here to help you get through something as simple as a gum stain to as complicated as pet odors and coffee stains, removed from your carpets	We are a fully licensed and insured corporation that can work through any cleaning circumstances. Give us a call today for a free quote over the phone. We will provide you the highest quality of services and dedicate our expertise in order to satisfy your needs and concerns in enhancing the beautification of your carpet. We can remove your traffic stains by the use of deep cleansing and getting down to the root of the problem. By doing so, we can make sure that not only do we remove the surface stains, but we remove the stains beneath the surface. Carpet Cleaning & Upholstery Cleaning Scams, some things to watch for. •Steam Cleaning in Richmond / Oakland.